*Image and book received from NetGalley for an honest review. Ella Patel couldn't care less about international politics since her amma was killed in the Alien War, her appa left her for dead and she ended up learning how to survive in the slum called Crate Town. Unfortunately she isn't given much of a choice in getting involved with the war when she is possessed by a Quasing (alien life form that needs a human host) called Io. To make matters worse, despite being around since the dinosaurs, Io really doesn't know what it's doing. Ella and Io must learn to work together if they're to be any help to the Prophus against the Genjix. If that's even what they want. You know you're reading a good, engaging book when you want to shout and scream "if you kill [character's name] I'm going to burn this book!" and you're reading an e-book. This book has EVERYTHING that I love! It's got action, it's got mischievous characters, it's got a fully developed world, it's got intelligent characters, and it keeps me guessing. I was so worried that, because Chu wrote other books about this world before this one I was going to feel left out or feel like I was missing something but no. The learning curve for this world was quite easy to follow. This book was so well designed. The pacing was perfect, I didn't figure out any of the twists and turns until the characters did. The dialogue and character development were wonderfully done. I'll admit, I have a soft spot for lovable trouble-makers like Ella, so I may be a bit prejudice. Her stubbornness and temper versus Io ages of experience and advice had me chuckling so often. I did feel a bit sorry for the people Ella took to dinner, though. As someone who has only made the mistake of eating spicy curry once, I can empathize with Hamilton and Carmen's distress. And the characters! Holy wah, the characters! Even the side-characters that only had a few lines were so well developed that I worried about them (see quote above). Whenever they engaged in dialogue it was always so real, so natural, that it was easy to empathize with them and want them to live. 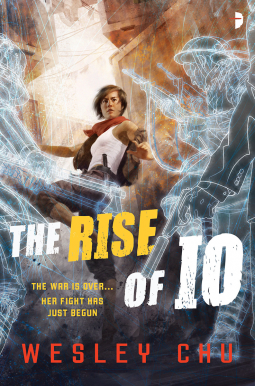 Rise of Io is such an amazing read that I now have no choice but to go and read Chu's previous series from this world. If you are at all interested in sci-fi, aliens, sci-fi military, or even street smarts versus military smarts, or just want a good read with great characters, pick up this book!